CBS Automotive, started in Cambridge over 50 years ago as Cambridge Battery Service offering Bosch Car Batteries, Alternators, Blaupunkt Car Audio. 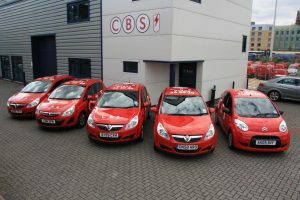 A huge demand for in-car technology led to the investment into the Mobile phone market and Cambridge Battery Service grew into CBS Communications; Offering not only Mobile phones, Car audio, Tow bars, and now Hands free car kits, CBS has become recognised as the centre for In-car technology in Cambridge. In August 2013 Naeem Khokhar, Director of Select Telecom decided to add to their already growing national hands free installations business by adding CBS to its portfolio, offering a regional installations centre in Cambridge and also a national coverage. ‘CBS Automotive’ offers the latest range of Hands free car kits, Car audio equipment, Parking sensors, Multi-media and Tow bars from all the leading manufacturers all fitted to a high standard. CBS Automotive based in Cambridge are specialists in vehicle installations and are well-respected and trusted within the UK automotive industry. CBS Automotive are main dealers for a range of market leading brands and are highly trained in vehicle installations including In-car entertainment systems, tow bars, tracking devices, hands-free car kits, parking sensors and security systems. Our dedicated team of experienced vehicle installation experts provide customers with a reliable, efficient and professional service tailored to your business needs. For your convenience we can provide some of our installation services at your home, business premises or via our ‘fit while you wait’ service, from our workshop in central Cambridge. Whether you are operating a fleet of vehicles, motorcycles or company cars, the comprehensive vehicle installation services from CBS Automotive are second to none.